I started the month in another state, with grand plans and a very compact travel box stocked with a small selection of beads. Working with what I had while trying to come up with designs, I could console myself that it would get easier when I got home. Once home, I lost that excuse. Plenty of others I could use - trying to get the house back in order after the trip, year end accounting, the cold that has plagued my husband for nearly a month and seems to be revisiting me. However I want to couch it, inspiration keeps slipping out the door and around the corner. I can catch glimpses out of the corners of my eyes, but as soon as I turn to look at it face on, I lose it. So I'm having to relearn to trust the process. I'm good with color; that's one of my strengths. I'm not afraid of it, and have always been willing to take chances. 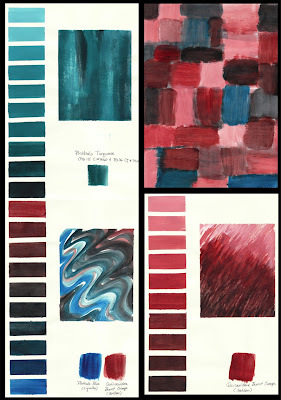 And if I'm truly at a loss, like I have been lately, I can always refer back to my book of painted pages. Hours and hours of work, painting out tints and shades, analogous and complimentary colors using acrylic paints - another one of those projects I used to fill time while waiting for inspiration. An amazing resource for days like these. My hands know what to do, once I settle on a stitch. 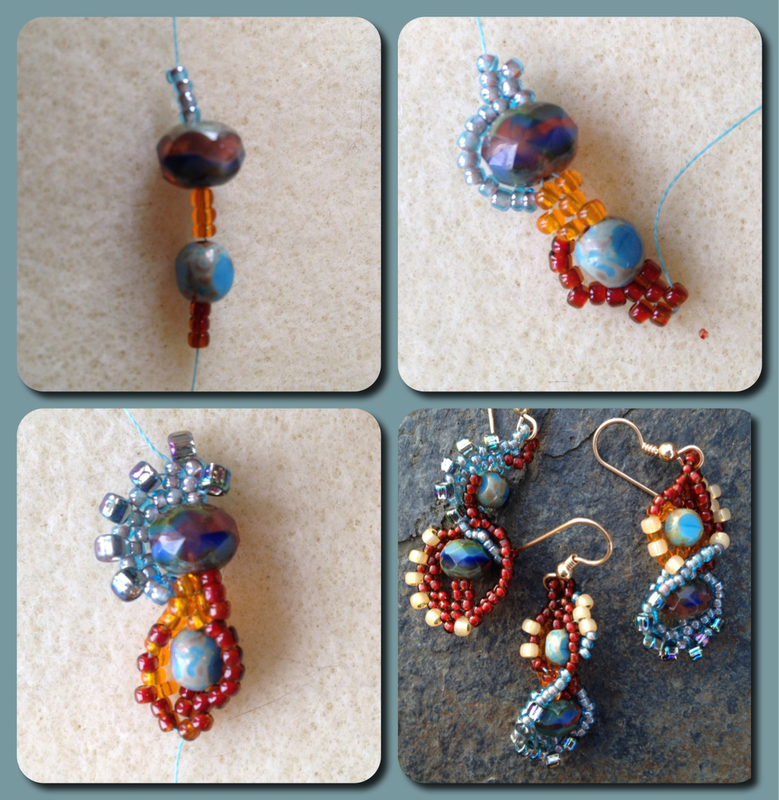 Perhaps we'll use peyote stitch this time I tell myself (yes, I talk to myself - too many hours alone in the studio ;-) ). We'll work around a couple of larger beads, with graduated sizes of seed beads. That could work. 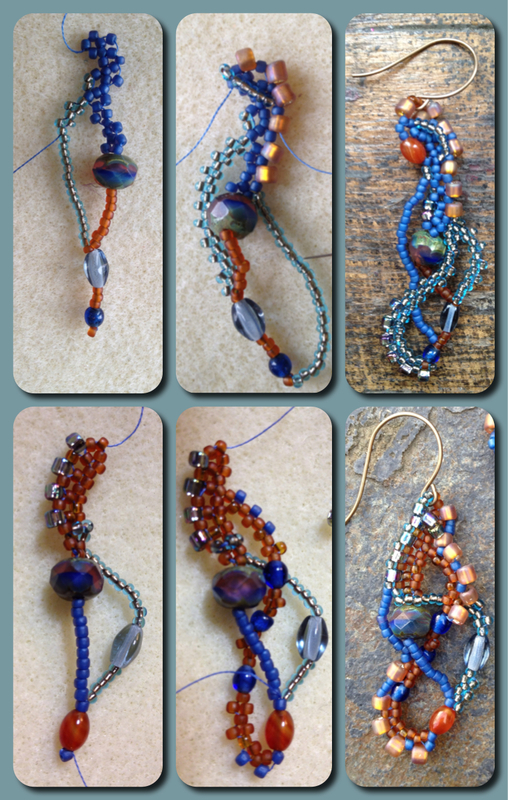 I thread the needle, pick up my first line of beads. Doesn't look like much. But I keep stitching, employing technique where inspiration fails. But the interesting thing is, inspiration seems to back flow in as I work. Maybe, just a little. Time to keep stitching. It is always good to have goals to push ourselves. The earrings turned out well. I love seeing the work in progress. The end results are stunningly beautiful! Every day I look forward to seeing what you made and it is always impressive. This kind of commitment must really be challenging! That feeling is so familiar. It's good to work on something else for a while and chances are a flicker of an idea will flash. Those ideas are usually a jumping off point for something very satisfying. 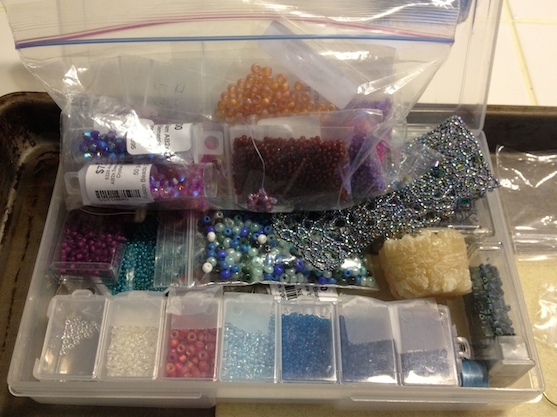 I know it gets strange when you look at the beads and just have no idea what to do. I have employed the same thing to just let the beads tell me where they want to be. Sometimes it is just the spark I need. Its been interesting to see just how many of us have written about similar topics - being stuck, lacking inspiration, writer's block - its a universal condition that can strike us all. What's interesting is how we all work to overcome it. For me, its remembering that you don't have to have the 'grand idea' in order to begin. Sometimes it's enough simply to start. Inspiration doesn't always come when we want it to, it's true -- but you're doing the right thing by trusting the process! I think anxiety over lack of creative flow is one of the things that can drag it out forever, so just sitting down with your beads and playing is the way to go. Also... your work fascinates me. Freeform peyote is so awesome!! I love seeing how your designs take shape.